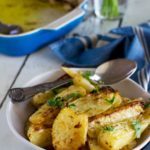 Gnocchi … those cute little potato dumplings that make a great pasta alternative. But have you ever tried adding them to a soup? Add chicken, veg and fairly low-calorie evaporated milk as well, and this Olive Garden copycat crockpot chicken gnocchi soup is one of the tastiest soups I’ve ever had! Everyone loves a good chicken soup, but when you add the word ‘creamy’ into the mix, and it can be made in a slow cooker, you know you’re really on to a winner! 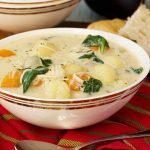 I discovered this crockpot chicken gnocchi soup recipe a very long time ago, but still make it regularly. It’s hearty, healthy, and absolutely delicious. Not to mention that it can almost make itself while you’re at work, like all the best slow cooker recipes. When we ate this hearty chicken gnocchi soup, it was thick enough to be almost like a casserole – rich and creamy (but NOT too calorific! ), warming, and flavoursome. BUT that’ s only because I was serving it for Sunday lunch and wanted it to be a proper meal. The beauty of this soup is that you can serve it like this, or keep it a lot thinner and serve it more like a regular soup. 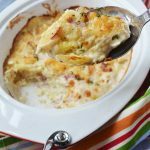 A great comfort food dish… but lighter! The other great thing about this crockpot chicken gnocchi soup is that although this is a lovely comfort-food style creamy soup, it’s pretty light. You see, I used evaporated milk in it and not cream. Plenty of veggies… and soooo creamy! So … what else is so great about this Olive Garden soup recipe? Well, it’s got plenty of veggies in the form of carrots, celery, onion and spinach in it (tick), and lots of chicken protein and yummy gnocchi carbs, making it a complete meal (tick). AND it pretty much makes itself because you dump it in the crockpot and run away (tick). Oh, and did I mention it’s lovely and creamy? For those of you who have ever been to Olive Garden in the US, yes, they do sell a popular soup quite a lot like this creamy chicken soup. I can’t promise it’ll taste exactly like it, but it’s a pretty good Olive Garden copycat recipe! Consider serving this soup with some toasted fresh crusty bread drizzled with olive oil and sprinkled with a bit of salt. I used my favourite packaged focaccia bread. 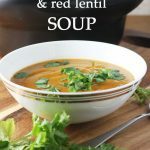 Let me know if you try making this soup in an Instant pot (affiliate link)! 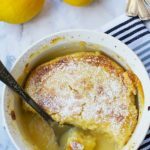 Or you wouldn’t go far wrong using a traditional Crock-Pot like this for this recipe (affiliate link)! A hearty, creamy and nutritious soup stuffed with chicken, gnocchi and vegetables... just like the one you love at Olive Garden! Delicious! Place the chicken, onion, carrots, celery, stock and herbs in the crockpot and cook on low for six hours minimum (or high for four). Shred the chicken in the pot, then stir in the evaporated milk, cornstarch, and gnocchi. Replace the lid of the pot. Now heat up a little oil in a frying pan and cook the garlic for a couple of minutes. Add the spinach to the pan and cook until wilted (a couple of minutes). Add the spinach and garlic to the crockpot along with plenty of salt and pepper to taste. Adjust the thickness of the soup to your liking (if too thin, add a little more cornflour mixed with water, if a little thick, add some water). Then serve in big bowls with toasted bread drizzled with olive oil and sprinkled with salt (if desired). Recipe adapted from Pass the Sushi, with a couple of tips from Pinch of Yum. If you’d prefer your soup to be more like a hearty chowder or casserole, just add a tablespoon or two more of cornflour. The soup is lovely heated up the next day, but I find some of the liquid is soaked up by the gnocchi in the fridge, so you might want to add some water when you re-heat it to thin it out again. Happy healing! This looks delicious- I may make it this weekend! I have mine in the crockpot as we speak! So excited to try it!!.. how long do i need to cook the gnocchi after putting it in the pot? I made this tonight. It was very good. Tasted awesome. I Followed the recipe. However, it was not like Olive Garden Garden. It was very good but it was just missing something. I have yet to try the crockpot version but in all over the stove recipes I made, nutmeg is part of that list. I usually add tons more garlic, seasonings, and lots of nutmeg. Better than the original! I look forward to trying yours! Oh yes, a touch of nutmeg would be wonderful! I think I considered adding it to my recipe but decided to keep the ingredients list as short as possible in the end. I have never eaten at Olive Garden, but I do love this soup. It’s so hearty and just what I need when it’s chilly out. This soup looks amazing! I love gnocchi! I have never been to Olive Garden, but now I don’t need to! This soup looks delicious. Soup is always the perfect comfort food. This looks so comforting. I just love adding gnocchi to soups, to make them much more filling. Thanks, Dannii! I’ve actually never added gnocchi to a soup before making this, but I certainly will again! So sorry to hear about the dental woes but if you are going to decide between your steak in the blender and this delicious soup. I think you know which one I would be up for. Love your creamy dreamy soup. I actually have never had Olive gardens soup but this recipe looks so good! Wishing you a successful and permanent tooth solution. Oh dear – I am so sorry to hear about your dental issues, Helen. I am glad you managed to catch the doc that afternoon after you displaced your new crown! Hahaha … yes, I agree that this is great for anyone, dental issues or no!! Dental appointments are not fun, hope everything is ok Helen! 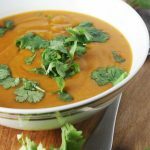 Love this soup, so creative and full of flavor! Perfect for the holidays! Everything is fine now, Mira. Thank goodness I don’t have to eat soup any more! Ta soupe est divine, elle a l’air tellement réconfortante! J’imagine déjà le mangé à côté d’un bon feu de chimené. Bon courage chez le dentiste et bon weekend! Thank you, Lorraine! This was the first time I’d added gnocchi to a soup too, but it really does work. Definitely a bit like dumplings. Wow this soup looks fantastic!! I’ve never had this soup before at Olive Garden but it sounds fantastic! I love the gnocchi in it! Thank you, Kelley … I hope you give it a go! Sorry to hear about your dental problem Helen. I hope you will recover soon! Glad you like this, Maggie. The tooth is OK now, thank goodness, but I’m still craving big bowlfuls of this! Hi Helen, oh so sorry about your tooth, going to the dentist is definitely no fun. Though I do love this soup, pretty clever to add gnocchi to the mix. Thank you for the good wishes, Cheri … tooth all good now, thank goodness. Goodbye to soup for the time being! Once I had added the spinach and garlic, I cooked it on “high” for half an hour, to fully cook the cornstarch mixture for maximum thickening. It needed a lot of salt and pepper and the touch of nutmeg, but it was delicious. Hi Susan! Thanks so much for the tips. That’s a great idea to cook on high for half an hour, and definitely something worth adding to my notes section. Oh my! To be honest I absolutely love this soup. It’s the main reason I visit Olive Garden. I usually end up too full from it that I end up leaving half my entrée (terrible habit but can’t help myself). 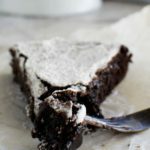 I’m not sure how this recipe ended in my page but I have been wondering how to make it at home. Really looking forward to trying it. I rarely use my kitchen but this is sure worthy. Thank you! I’ve never had gnocchi’s before. I bought them just to try and go with a sauce…..turns out they’re for soup lol I didn’t know that. So perfect on Thursday I was going to make soup anyway so this is perfect. I can’t wait to try this. Now that the weather is turning into fall. 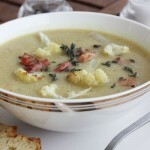 I am making this soup for a football get together this weekend and can’t wait to try it! Do you leave the crockpot turned on when you add the gnocchi and spinach, if so for how long? Or do you turn it off and just leave it covered for a period of time to allow the gnocchi to cook? Hi Marie, so happy to hear you’re going to give this a go! You can definitely leave the crockpot on when you add the gnocchi and spinach. You just do all those final little bits (shred chicken, add cornflour and gnocchi, add spinach and garlic) pretty much at the last minute, and then serve when you’re ready. Don’t worry about it getting spoiled – it’s on low heat remember, so it’ll be fine! I have this in the crockpot right now! Once I add the spinach and gnocchi, how long can I let it sit in the crockpot until we eat it? Can I keep it on low (or warm) for another hour or so until everyone is home to eat? Can’t wait to taste it! This soup is the only thing I order from Olive Garden so I hope it’s similar!! Sorry if I missed it somewhere, how many people does this soup serve? It sounds delicious and I’m excited to make it! Hi! So sorry, that is indeed missed out of the recipe. It serves 8 (maybe more if you choose to make the soup on the thinner side). Enjoy! Can I leave this on all day? 10 hours? Hi, Kate. Sure! Just make sure you still leave all the last ‘bits’ until you’re home e.g. adding the gnocchi. Hi Josh! I don’t know exactly what size my crockpot is, but it’s on the smaller side, so as long as yours isn’t TINY you should be fine. Good luck! Can I prepare this before work around 730am and eat at 530? Would it be to thick if I added everything in the crockpot on love for 8 hrs? Hi Holly! Yes, absolutely! Just make sure you add the last few ingredients (spinach, gnocchi etc.) when you get home. Enjoy! Would it be a big deal if I don’t have any basil? Not at all, Megan – go for it! This may seem like a stupid question but is the chicken cooked or uncooked when you put it in at the beginning? Hi LeeAnn – no question is too stupid to ask! Pop the chicken in uncooked! It will slow cook and be really easy to shred into the soup when you’re ready to eat. 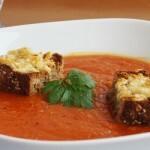 Hope you enjoy it – I love this soup! For some reason I can’t seem to thicken the soup, it ends up having a bit of a powdery taste in some bites any tips! Just made it and it is just like Olive Garden. I put lots of Italian seasoning…so much so as it began to cook n smell I was a little fearful. After its all done though it is awesome! This is one of our favourite dinners. I’ve made it so many times now. Sometimes I make it a bit thinner than the recipe suggests, but it’s delicious every time! Thanks so much for bothering to leave your feedback, Louisa. This is one of our favourites too. I must make it again soon! You have me craving this soup now :-). I love how close this is to Olive Garden’s soup. So glad you like it, Sandi. Thank you so much for leaving your review! 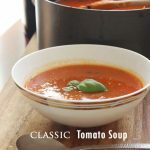 After making this incredibly delicious soup, it’s one of my favorite Olive Garden copycat recipes! Thank you so much for sharing this recipe gem. You’re welcome, Denay. Thank you so much for your glowing review! Hello, this looks amazing. I have the ingredients to make this except the store was out of fresh spinach. Will frozen spinach be okay to use instead? Hi Amber! Yes, absolutely fine. Just defrost the spinach and squeeze out a bit of the excess water, then add at the same time as you would add the fresh spinach. Good luck! Thank you that is what I did. It’s in the crockpot now. Just waiting for hubby to get home. It smells delicious. So happy to hear it turned out well, Amber. Thank you so much for letting me know! 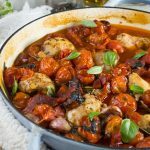 what would be the best type of chicken to use (or cut) for this recipe? Hi Brianna! I use skinless boneless chicken breasts! Hi Katie! I think you might be referring to the water that you mix in with the cornstarch? If so, you just add a little bit of water to your cornstarch so that you can pour it into the soup without it being all lumpy. Let me know if this isn’t what you meant! Good luck! How much is one serving size? Hi Lauren! There are about 8 servings, but it does depend a bit on how thick you want the soup to be. I’m afraid I don’t know exactly how big each serving size is, but with some crusty bread it’s enough for a main meal size for everyone. Hope you enjoy it! I’m not sure what I did wrong, but mine turned out super runny. I added a couple more tablespoons of cornstarch but it would not thicken. I didn’t want to add anymore in fear of making it feel gritty. I had the crockpot on high, but does it need to boil in order for it to thicken? I’d love to try it again, I just wish I knew how to make it thicker. I was really wanting more of a chowder. Hi Sara! Oh what a shame it didn’t end up exactly as you were wanting it to! Actually the first time I made this it was a bit too thick for our liking (husband called it chicken gloop!) which is why I played around with making it thinner. I think it really depends on a lot of things – your slow cooker, the length of cooking, when you eat it etc. I’d suggest adding a bit more corn starch at the beginning when you put the slow cooker on, and also a bit less broth/stock, and see how that goes. I also find the soup’s a lot thicker the next day after being in the fridge overnight, so you could try making it the day before. If all else fails you can pour the soup into a pan and boil it vigorously for a while before serving. That would thicken it up. I hope those tips help – good luck! So I’ve made this recipe before, but it’s been some time since then. I made this today and am disappointed by the results. The soup is very watery and doesn’t have the creamy taste of Olive Garden’s chicken gnocchi at all. If you’re looking for a thicker, creamier soup, I’d recommend using half and half instead of the evaporated milk. And no need to cook in a crockpot. Sautee the veggies and chicken and throw it all in a pot and you’ll be fine. Also, boil the gnocchi before tossing them in the pot with the rest of the meal, and let the spinach wilt in the pot with all the ingredients rather than cooking separately. Next time I’ll pay more attention to which links I’m clicking! Hi Brittany, I’m disappointed that you didn’t think much of this recipe of course, but thanks all the same for leaving your honest feedback. 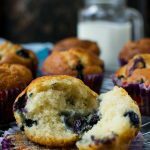 I do tend to veer a little more towards healthier recipes on my blog, and using as few ingredients as possible to fit with my quick and easy focus. I didn’t change this recipe too much from the originals I based it on, however. As for the thickness, there’s a note in the recipe about thickening the soup if you prefer it thicker, or I usually find the leftovers are thicker the next day. Good luck with finding the recipe you like better! Oh, and thank you for the tips for cooking on the stovetop. I will have to try that! I’m surprised at some of the negative reviews. I made this exactly as the recipe says for a family Christmas (I actually doubled the recipe), and EVERYONE loved it, including the kids! I thought it was so DELICIOUS! Thank you for posting this recipe, we love it!!! *And for people who want it more soupy, just add more milk as stated in the recipe notes. We added a lot of milk to make it thinner, and it was great! That’s OK with me, but I’m so glad you all thought it was delicious. Thank you again – really appreciate it! I completely forgot to by gnocchi? Thoughts on how I could adjust and add egg noodles instead? Thanks! Hi Ally! I think egg noodles will work just fine. What I’d do is take the lid off your soup at the end of the cooking time, turn the crock pot up to high and add the noodles for the length of time stated on the packet (10 mins? 15 mins?). Just test at the end of cooking of course, and you should be good to go!